Anchor Motel and Cottages located at Geneva On The Lake, Ohio. Recipient of the Ashtabula County Convention & Visitors Bureau Tourism Excellence Award 2013 Business of the Year. 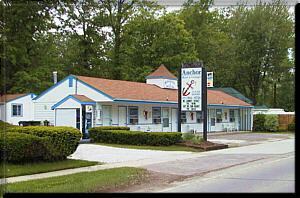 The Anchor Motel and Cottages are located in historic Geneva on the Lake, Ohio, one of Ohio's oldest and most exciting resort towns, and as a resort town, Geneva on the Lake offers something for everyone! Geneva on the Lake, Ohio is without equal, and it's the perfect getaway for everyone! The highly rated Anchor Motel and Cottages offers 42 exceptionally clean, newly renovated rooms and fully equipped cottages all conveniently located on the Strip. You will be within walking distance of all of the area attractions. Just minutes from Geneva State Park and Marina, you will be centrally located to all of the fun and activities. Located in Ashtabula County, just minutes from Ashtabula Harbor, the shores of Lake Erie offer unlimited water activities. Whether you prefer swimming at Breakwater Beach, fishing for Walleye, Steelhead, Bass or Perch, sailing, scuba diving, jet skiing, beach walking, sunset watching, charter fishing trips... Well, you get the idea. For the landlubber there are many parks, wineries, arcades, restaurants and night clubs within walking distance, not to mention our eight 18-hole golf courses. You can sit and people watch, or enjoy the classic hot rods and motorcycles cruising the strip daily. Please review our accommodations pages, select your unit and either book on-line or give us a call with any questions or to confirm your reservation. You can find information about everything located in Geneva-On-The-Lake, Ohio at this web site. You can find information about everything located in Ashtabula, Ohio at this web site. Things To Do In Ashtabula, Ohio. Click here for all the details that the Ashtabula Harbor Ohio has to offer. Customer Satisfaction Is Our Main Priority. Satisfaction Guaranteed!